Trouble keeping the little one on lockdown? We know it’s hard to keep any semblance of order in the house when you have a cute, curious little crawler snooping around where they shouldn’t be. Keep baby tucked safely away where they can play to their heart’s content. Baby gates help to quarantine rooms of your house so that your little one never goes wandering where they shouldn’t be. There are gates that are free-standing, gates that block off door jambs, and more. With so many sizes and installation options available, you can tailor your gate to be just what you’re looking for. 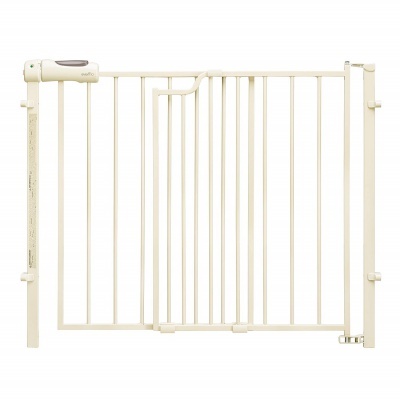 Take control over your little one’s safety with these fine baby gates! Comparing products can be a headache and when you're trying to take care of a family, you need every extra minute you can get. That's why we're shifting all of our guides over to a brand new format that helps you understand the features, pros, and cons of each product. We know it’s frustrating to finally find the perfect product--only to realize that it’s no longer available for purchase, or won’t be restocked for quite some time. That’s why Born Cute makes it a priority to revisit our guides frequently to update our inventory. Enjoy! Baby safety gates are a must if you have a two-level home or even if you want to gate baby off from the kitchen or another room for safety reasons. This updated list contains a couple of new options that meet our high standards of criteria and will provide you with the peace of mind that baby is safe behind of these gates. Additionally, all product information including sizes, construction, installation, use, cost and availability, have been reviewed and verified as accurate. It’s a really lovely aesthetic, while still being effective, convenient, and safe. Kids can’t bust loose, but adults don’t have to fiddle with difficult safety locks every time they’re passing through. This gate will keep baby from wandering off where they shouldn’t be snooping. It’s tall enough that they can’t lift themselves over it, with bars that are designed to discourage little monkeys from climbing. It’s adaptable to any space and you can purchase as many additional panels as you need to fit truly large enclosures. The door can expand and provide an extra wide 25.5 inches so you can fit through with the bulky baby gear. The gate can also be detached from its brackets and swung out of the way when it’s not in use. The gate features pivot points so you can configure it for any space. To add additional length to your barrier, you can purchase and connect additional panels. Adults can operate it one-handed and a stay-open feature means you aren’t constantly having to unlatch or push it every time you’re coming through. Finally, the matte bronze finish offers an elegant, classic look so you aren’t constantly staring down cheap plastic or wood paneling in the middle of your home. 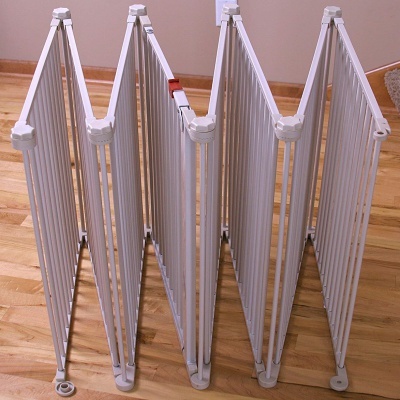 The North States 72” Deluxe Baby Gate is durable, convenient, versatile, and secure. It’s build from heavy-duty metal and features bars with openings that are narrow enough children can’t fit through, while still being wide enough that they can’t easily climb them either. 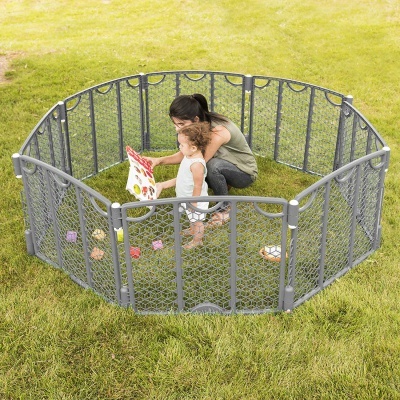 The double-locking system and added height means there won’t be any baby jail breaks. The easy release system with the door that swings both ways makes this gate a great option for high traffic areas. The metal design with sleek finish gives it a great look. 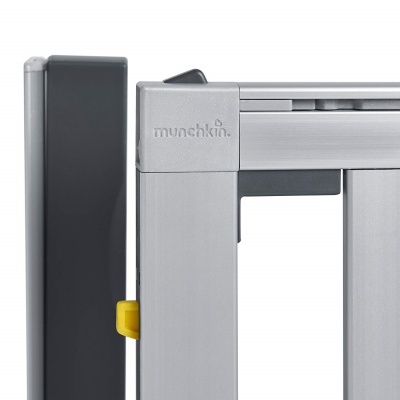 The tuning system makes the gate easy to install even in the most uneven areas. The gate can be extended to create a secure fit in a variety of openings. With the quick release, feature it can also be removed completely and then placed back in place. It is a great gating system for doorways and halls along with stairs as well. The height is 30 ½ inches tall and will fit an opening of 26 ½ inches to 40 inches. The modern style and functionality of this model offer a sleek design that complements any home, is easy to install in even the most irregular walls, and easy to open and close. The metal gate is easy to install and features pre-set gating positions. When the gate is installed it can easily be removed with the quick release system. It features a swinging door that opens both ways and has a dual lock system on the handle. It can be opened with one hand and is child proof. The gate fits doorways, hallways, and openings of 26 ½ inches to 40 inches wide. It measures at 30 ½ inches tall and is silver in color. The Munchkin Loft MK001 makes creating a safe area for kids easy. The design and technology used in this gate make it easy on the eye and stress-free to use. The double-locking system is simple enough for adults to manage but keeps kids from busting out. 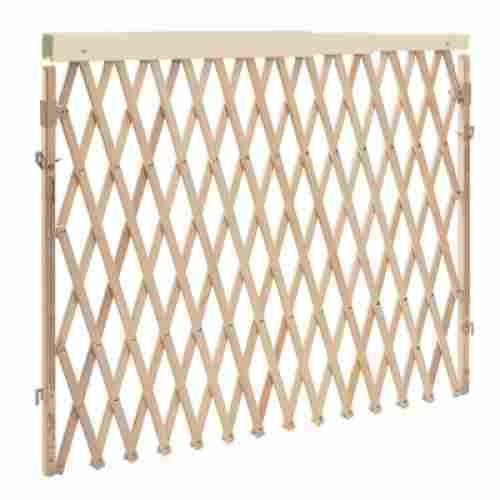 This beautiful slatted gate features a self-locking mechanism and is easy to install. It's sturdy and includes a locking base so you can leave the gate open if baby's occupied elsewhere in the house. It is 29 inches tall and can be between 29 and 40 inches wide. Don’t try stepping over the gate to get to the other side. Simply pull and lift the handle to walk through. Designed with a dual locking mechanism, you can control the gates swing by setting it to one direction or two. The gate is just as easy to close as it is to open. Just give it a gentle push and it locks back into place. The wood provides a more quiet close than metal gates. The auto closing door is a wonderful feature in addition to the dual locking gate that is child proof. The pressure mounting is easy to install and included in the wall cups for added security. 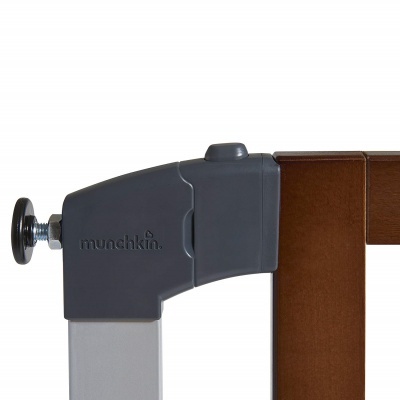 The Munchkin Auto Close Model is composed of both wood and steel, thus making the frame highly durable and sturdy. While this is a pressure mounted gate, it also includes a hardeware mounting kit for extra safety. It has been safety tested and is certified by the JPMA. 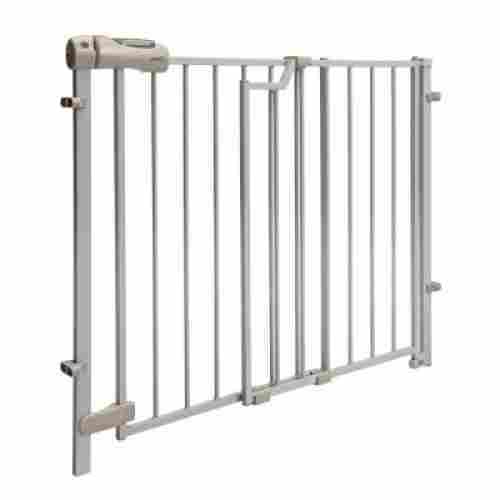 The multi-purpose gating system can be used in an opening, to create a barrier, or used to make a play yard. This steel design is sturdy and offers an easy to store feature. The gating system is extra wide and fits any opening up to 192 inches. It includes eight panels that are 24 inches wide. Each of the panels are hinged making the possibilities of shaping endless. It can also be put all together in an octagon shape to make a play yard. The panels each measure 28 inches tall. One panel in each set features a gate with an east open and lock lever. The gating system is simple to setup and features a stacking feature that allows them to be stacked together for easy storage. 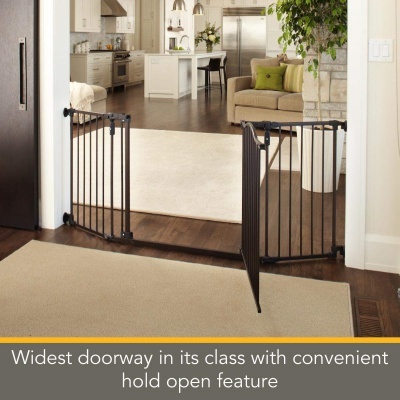 The gate is simple to install and features a walk-through door that is easily passed opened with one hand. When not in use the system folds together for storage. It is constructed of durable steel and it painted white making it match most home décor. 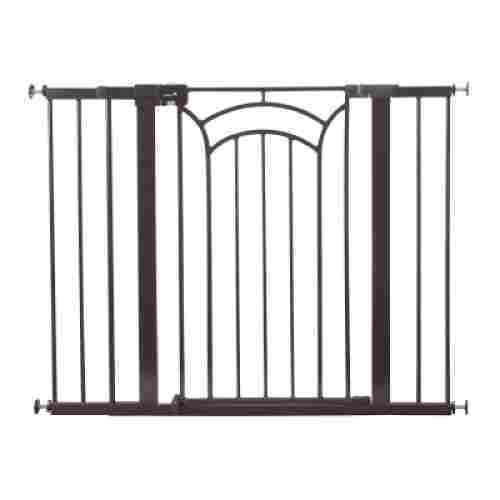 The gate is constructed of heavy-duty steel and is very durable. It features a two-in-one design, is easy to setup and configure, and conveniently folds down for storage. 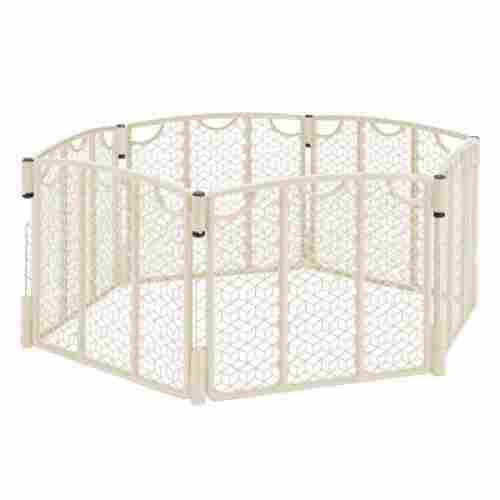 The Regalo Play Yard 1350 DSis great for wide openings and keeping your child safe. The dimensions of the gate and its neutral color allow it to fit perfectly in practically any home. Its hardware-mounting system and colored lock indicator will provide you with the reassurance that you need to let your baby roam safely. 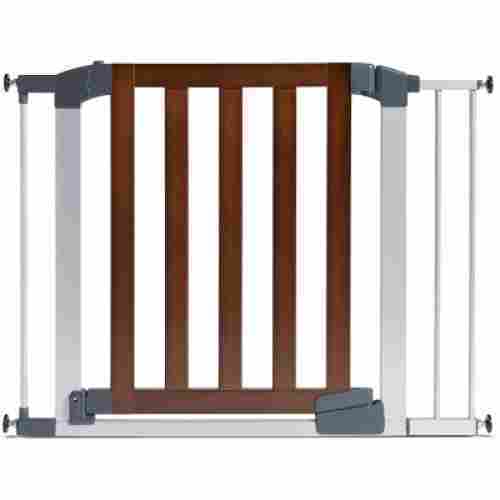 The Evenflo Easy Walk Thru gate is ideal for placement at the top of the staircase. 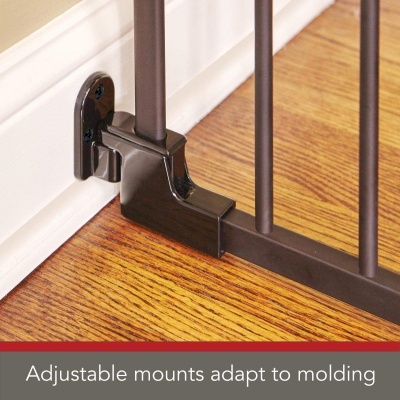 Designed with a four-point hardware mount, the gate will securely fit in place and will not budge once it is mounted. It has the ability to expand from 29 to 42 inches wide and is 30 inches tall, thus allowing it to fit the staircase entryway for most homes. Additionally, you can moderate whether the gate swings one way or two by removing the lock stop. If you’re toting your baby around the home and you find yourself left with only one hand free, don’t stress about how you’re going to get through the gate. Just as the name suggests it is easy to walk through. 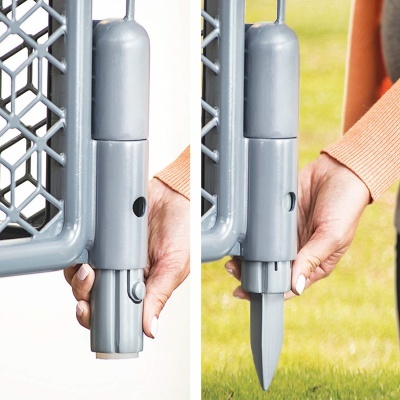 The one-hand handle makes it easy for you to slide the handle, which unlocks the gate, and walk through. While the handle will be easy for you to open, it will be too difficult for your child. Do you get that nagging feeling that maybe the refrigerator or car door didn’t really shut all the way? Amplify that panic a few times when it comes to second-guessing your gate. This gate features a color-coded system to let you know whether the gate has clicked fully into place, based on whether you see red or green on the indicator. The SecureTech Indicator will alert you when the pressure needs to be adjusted to make the gate safer. 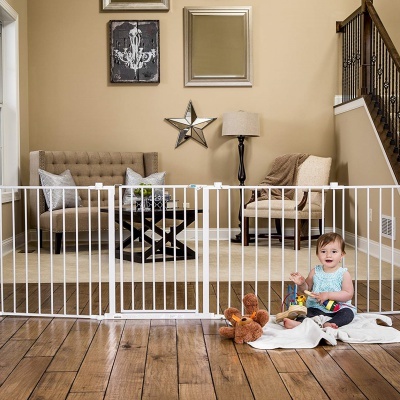 Not only will the gate keep your child safe but the modern design will make it look great in your home. Measuring in at 36 inches high, the gate is designed to be extra tall thus making it impossible for your child to climb over. 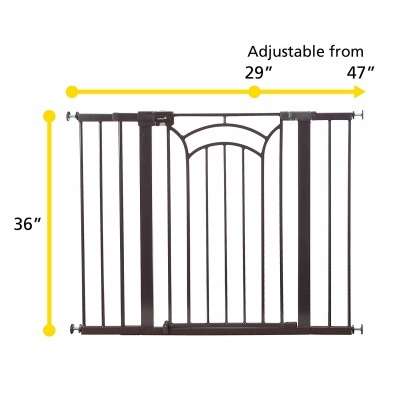 The width of the gate can be adjusted from 29 to 47 inches to easily fit into any opening. 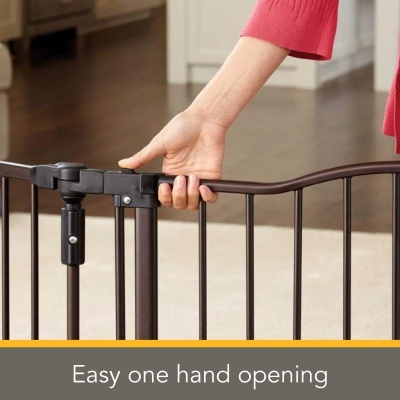 The Safety 1st decor baby gate is designed to look stylish without sacrificing safety. The modern decorative design and its neutral color will add a touch of elegance to any room in your house. Installation is quick and easy with this pressure-mounted gate as no tools are required. Equipped with a SecureTech indicator, a red light will let you know when you need to adjust the pressure for extra safety. A green light lets you know the gate is secure, stable, and safe enough for your child. It is JPMA- certified and meets the ASTM’s safety standards. The wood and plastic design are simple and easy to use plus the retractable design makes it easy to move in a tight space. It features a mechanism to help save little fingers from pinching as well! This is a great gate for a doorway, the bottom of the staircase, or a hallway. It includes an easy-to-mount system with hardware that is included. When opened, it can swing either direction and can be opened from both sides. The divider works in openings that are 26 inches to 60 inches and is 32 inches tall. This gate can expand to fit wider spaces, or retract to allow you through without having to dismantle it each and every time. It swings in both directions and features a special top railing that keeps fingers safe from nasty pinching points. Adults can operate this one-handed, but it’s child proof, so your little one will still be secure. With four mounting points and included hardware, you know you’re not dealing with a flimsy design here. The simple-to-use and -install design is practical and makes using a gate in a tight area easy. 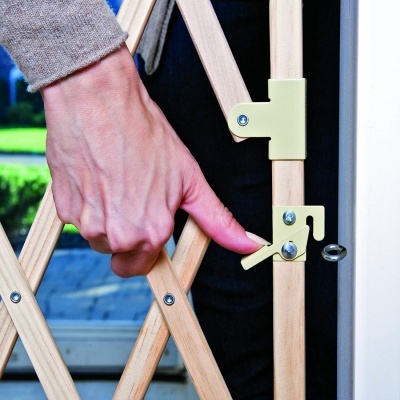 The retractable wood telescoping gate features a rail that prevents little fingers from getting pinched. 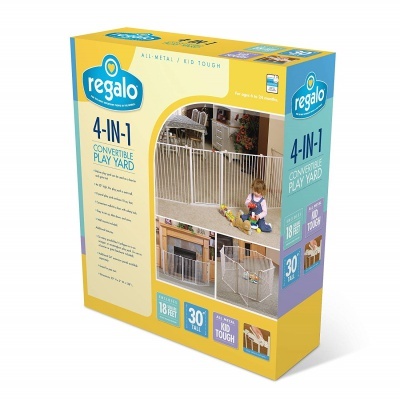 The Regalo Home Accents 0310 DS will give you the peace of mind you need to let your little one roam around freely. The design of the black steel and wood make it look fashionable while still providing a super stable and strong design. The walkthrough baby gate is great for small children and it also can be removed when not in use. The pressure mounts make setting up and taking down the gate super easy. The pressure mounts are rubber and will not leave any scratches on your wall. Since the it is lightweight and flat, you can easily pack it in the car for your next family vacation. The steel material guarantees that it will last for years to come. It's a sturdy build that, when installed properly, can hold up against rough little hands. The locking mechanism isn't easy for children to open either. The extra tall gate is designed for growing babies and families. The one-touch door opening system is a great feature that makes it easy pass through when your hands are full. It is designed to fit in openings that are 29-37.5 inches wide. An expansion kit is included with your purchase that will allow the 1166 P DS to expand by four inches. The platinum will look great in any home with high-end finishings. With the Regalo Deluxe 1166 P DS, you won’t have to worry about your pets jumping over it as it is 41 inches tall. The height is also a huge advantage for you because you won’t have to bend down to open the gate. You can easily reach it, even when your hands are full. The one-touch release makes it even easier for you to open the door and walk through. There are no tools required in setting up this system. The pressure mounts will keep this gate in place whether it is put in a doorway or at the bottom of the stairs. The steel material used in the construction makes it sturdy and durable. It will be able to survive whatever your pets or children put it through. This gating system is designed to be used indoors and outdoors. It makes a safety enclosure that keeps kids safe and is easy to set up. The set includes stakes for outdoor use and pads for anti-movement for indoors. Looking for something that you can use both indoors and outdoors? The Evenflo Versatile Play Space might be your solution. The eighteen and a half feet of space is a wide enclosure, allowing your little one the room to move about and work those little muscles and lungs! It’s easy to set up, comprised of six UV resistant panels that lock into place sans tools. 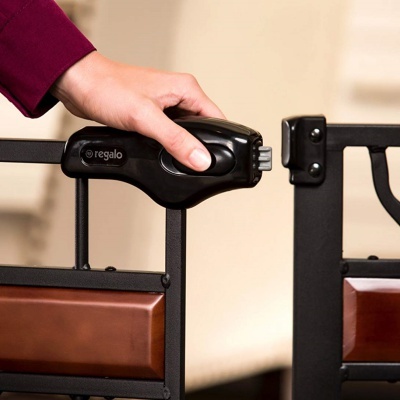 The easy assembly and foldable design make it great to travel with. When constructed, the enclosure provides 18½ square feet of playing area. The system stands at 28 inches tall. The system requires no tools to assemble and is quick and easy. The system also features stakes and grip pads to keep the unit from moving around, no matter if it’s in your yard or in your living room. This adds stability and versatility to this gating system. The stakes and anti-movement pads are a great addition to an already well-thought-out product. Homes come in many different shapes and sizes. We know that purchasing a baby gate can be a frustrating endeavor when you have very specific dimensions to fit, or are trying to enclose them in a space that deviates from standard shapes. We've tried to make sure that the majority of options on the list allow for some versatility and can be adjusted to fit the needs of your specific home and family. You have your hands full as it is; we get it. Baby-proofing the house is important but it doesn't need to impede on everyday life or the productivity of the parents. There are plenty of products out there that are designed to be difficult for little hands to manage but simple for adults to reckon with. No need to practice pole vaulting just to get into the kitchen; choose a gate that is rated highly in Ease of Use is this is of concern to you. More and more families are recognizing the need to childproof their homes. According to the Centers for Disease Control, there are more than 9.2 million children who are treated in an emergency medical facility for unintentional injuries. These are injuries sustained from burns, falls, poisoning, drowning, suffocation, and those related to vehicular accidents. Among the cases that resulted in moderate to severe injuries but were not fatal, falls are a leading cause, accounting for close to 3 million cases every year. More than 50 percent of fall victims were young children below 1 year of age. Falls were followed by being struck by or being hit with an object. Also noteworthy is that children below the age of 1 year had a significantly higher incidence of suffocation. Childproofing our homes, especially if we have very young children roaming the premises thus, becomes an important responsibility. The use of baby gates is just one of the ways in which we can safeguard our children. These devices or systems effectively prevent children from going from one level or area of the house to another which can be dangerous if stairs, appliances or heavy pieces of furniture are involved. Keep all electrical outlets protected. – Plug-in caps are essential to childproofing your home; unless your electrical outlets are located high up on the walls, above a counter for instance or near the ceiling. Unfortunately, if your child is naturally curious, these plug-in caps might well end up in your kid’s mouth. A safer alternative is for you to replace all of your electrical outlets with those that have security latches. As much as possible, don’t use any extension outlets/power strips. But if this is unavoidable, then protect these as well. Check ties and cords especially on curtains and blinds. – The exposed ends of these ties or cords can potentially get wrapped around your child’s neck. As much as possible, cordless window coverings should be used. Secure every window and door in your home. – Window guards or stops can be used to help prevent falls. Make sure that low windows cannot be opened more than 4 inches. Window stops can again be attached to help prevent windows from opening more than what is considered safe. Prevent poisoning. 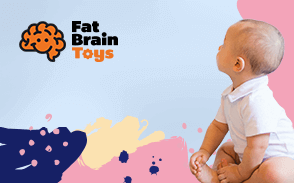 – Always be on the lookout for substances that are potentially hazardous to your child’s health. Check for lead, phthalates, and BPA as well as other harmful chemicals products, like cleaning solutions and medications. Prevent drowning. – Never ever leave your child alone in the bathtub, pools or even in parts of the home where there is a considerable amount of water such as areas with buckets or basins filled with water. 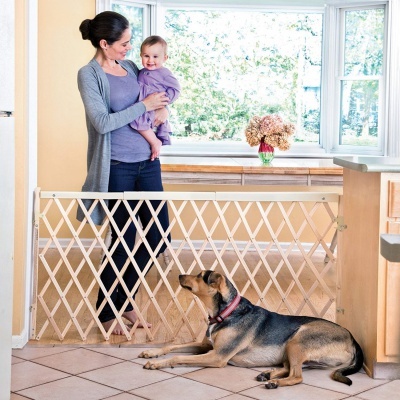 Do you want a baby gate that is entirely self-contained or one that simply quarantines parts of the house? When trying to decide this, you'll want to look at how child-proof the different rooms in your house are. Look at your home from the perspective of your baby. – Standing upright and looking at the different parts of your house will give you a false sense of security simply because you are not looking at it from how your kid sees it. The best way to start childproofing your home is to get down on your hands and knees and scan your surroundings so you will appreciate what your child actually sees whenever he or she performs his or her daily routine exploration. Another way to put it is to think like your child. If you were your kid, where would you go? What will arouse your curiosity? Do you think several electrical cables sprawled on the floor are safe to hold? How about coins and other loose items such as medicines, paper clips, beads, marbles, and other stuff? When you get down on your hands and knees you will see what your child sees. This way, you will know exactly where to start childproofing your home. Fix furniture and other heavy fixtures onto the floor or the wall. – One of the inherent dangers at home is children getting hit by falling objects or, worse, being hit by furniture or appliances that tip over. If at all possible, you should fasten or secure these objects to the floor or against the wall so they won’t fall on top of your kid. Remember that young kids will pull on almost everything and anything they can hold on to as soon as they start crawling and can pull themselves up to standing. Additionally, you have to make sure that all drawers of your cabinets and dressers are always kept closed. These can function as stairs for a child which can lead to injuries sustained from falls. q: When is it time to start using baby gates in my home? It is time to start using baby gates in your home when you notice that your baby is showing signs of crawling. That usually is about 7 to 10 months old. It is best to install them before they even start to crawl. q: Do all baby gates require hardware to be installed on the walls? All baby gates do not require hardware to be installed. 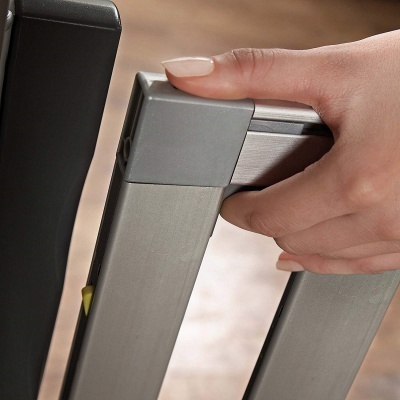 There are pressure-mounted baby safety barriers that use tension between doorways and walls to create a secure fit. Only at the top of the stairs are gates that use hardware or are hard-mounted required. q: Where can I find the product listed on the 10 Best Baby Safety Gates to purchase? 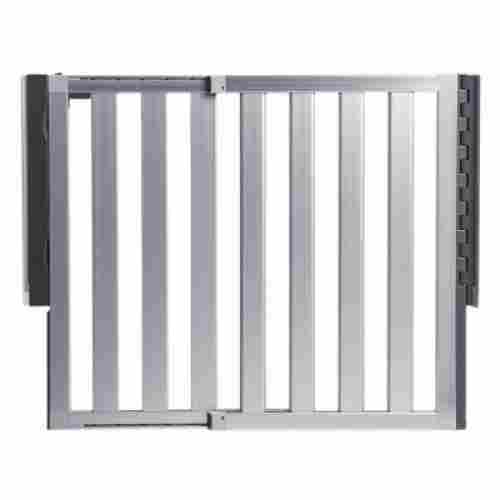 All the baby gates can be purchased by clicking the link below the product picture. The link will take you directly to Amazon where the product can be purchased. 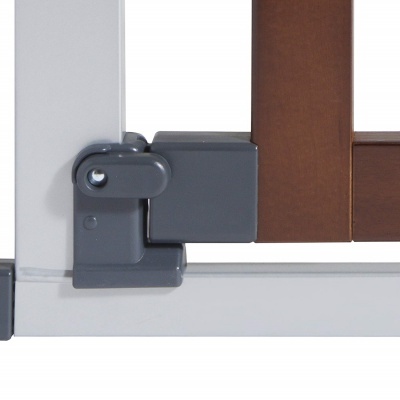 q: What is the difference between pressure-mounted baby gates and hardware-mounted baby gates? The difference between pressure-mounted baby gates and hardware-mounted baby gates is the way they are secured to the wall or doorway. Hardware-mounted gates require screws and installation whereas pressure-mounted gates use pressure against walls or door frames to secure them. 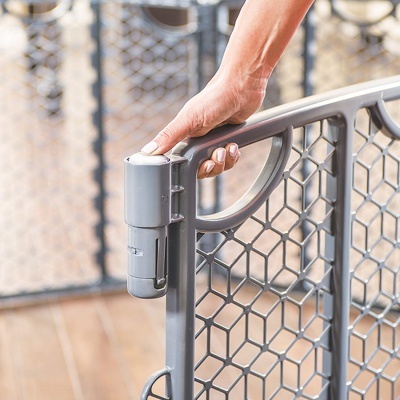 Pressure-mounted gates can be used anywhere in the house except at the tops of stairs. Gates that are used at the top of the stairs are required to be secured with hardware. q: How do I know when it is time to start childproofing my house? It is time to start childproofing your house before your baby starts to crawl. When they start to crawl, they start exploring the world around them and you want that to be as safe as possible. q: Are gates with doors better than gates that are removable after each use? All models have their own features that make them more desirable than others. The best way to choose a gate that works best for you is to review the features. Gates with doors can be nice for areas that you walk through often so they do need to be removed or left completely open each time you need to walk through. Gates that are removable allow you to have a safe area when needed, but they can be removed to use the full width of the opening.